Giannis was awesome. Very hospitable, welcoming, knowledgeable, helpful and went out of his way to make us comfortable. He is a real asset to Aria Hotels. The view was the best ever. Beds so comfy. The view is spectacular! But you pay the price for that! It was cute and traditional. Had plenty for breakfast. Vue exceptionnelle. Personnel pas disponible. Accueil pas tjrs ouvert ?? Seul hotel des Cyclades qui ne vient pas nous chercher au port le soir (20euros de taxi!) . 7 kms du centre. Impossible de modifier la réservation. Die Aussicht ist ein Traum! Man ist privat und kann super auf der großen Terrasse (wir hatten das Zimmer für 2 Personen) entspannen und hat dabei direkten Blick auf den Hafen. Der Aufbau des Apartments macht den Aufenthalt sehr besonders, da 3 eigene Türen zur Terrasse führen. Wir wurden super nett empfangen und von der Dame am Ende des Aufenthalts sogar noch zum Hafen gefahren (es gibt nämlich nur 4 Taxis auf Serifos, was es schwer macht spontan eins zu bekommen) man sollte das unbedingt am Vorabend reservieren. Frühstück war ausreichend aber nichts besonderes (Toast, Schinken, Käse, Eier, Marmelade, Honig, Butter und verpackte Mini Croissants - kaffe leider nur Instant bzw auch Filterkaffee uns haben aber die Filter gefehlt) Wir können die Unterkunft nur weiterempfehlen. Es ist besonders und der Blick wirklich unvergesslich. La vue spectaculaire mais on s'en lasse vite quand les conditions de logement ne se prêtent pas à la relaxation L'extrême gentillesse et disponibilité de Giannis, employé de la chaîne des hôtels Aria, qui s'est vraiment investi personnellement pour faciliter notre séjour. Il a fait lui-même des réparations électriques (pas de lumière dans la salle de bains vu l'état de la prise). Il est allé acheter des petites cuillères, vu qu'il n'y en avait qu'une. Toutes ces tâches ne lui incombaient sans doute pas mais il a eu à coeur de compenser les défauts du studio. Η θέα Η βίλα Η φιλοξενία Η ησυχία του μέρους. Η ησυχία κ ηχομόνωση που προσφέρει η ίδια ή βίλα. Όλα ήταν τέλεια Οι φωτογραφίες νομίζω δείχνουν λιγότερα από όσα προσφέρει η βιλα. Ο ξεναγός (Κος. Γιάννης ) τρομερός, μας βοήθησε παρά πολυ κ μας έδειξε τα καλύτερα μέρη για επίσκεψη, οπότε τον αναζητήσαμε ανεξαρτήτου ώρας ήταν στην άλλη γραμμή να μας συμβουλέψει ακόμη κ να έρθει εκεί που είμαστε να μας γυρίσει στη βίλα. Η καθαριότητα σούπερ ότι ζητήσαμε το είχαμε με το παραπάνω. Η άνεση της βίλας ; από που να ξεκινήσω ; Μόνο θετικά έχω να γράψω για αυτό το μέρος. Το κόστος ήταν ακριβό για 3 νύχτες όμως το άξιζε πραγματικά. Παραπάνω ποιότητα από την τιμή σίγουρα. Αν ποτέ κάποιο καλοκαίρι με βγαλει στη Σέριφο σίγουρα θα ήθελα να μένω σε αυτό το μέρος κ με αυτόν τον άνθρωπο να μας καθοδηγεί κατάλληλα.!!! Die Lage in der Höhe, fast auf einer Krete war spektakulär und die Aussicht war grandios, ist aber in der Villa mit 2 Schlafzimmern etwas beeinträchtigt ( Blick auch aufs Dach der vorderen Unterkunft). Gute Bettqualität und ruhige Umgebung. 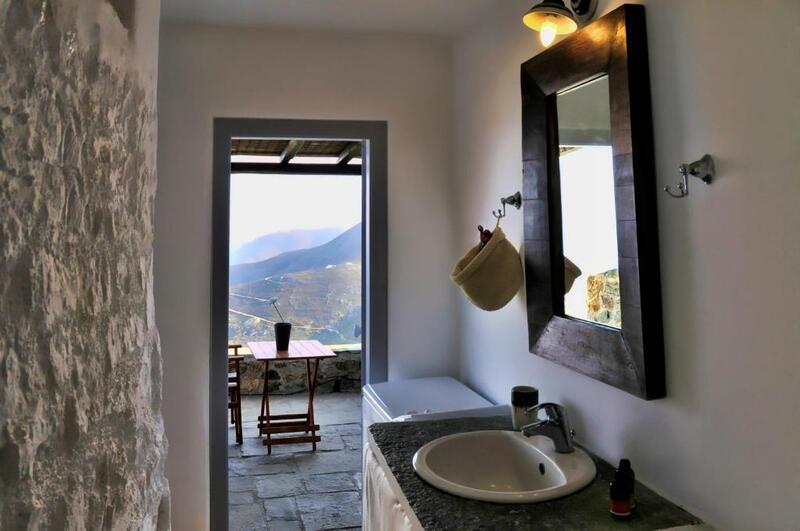 Peacefully located 0.9 mi from the settlement of Panagia, Aria Serifos is a complex of traditionally built villas with modern Cycladic-style decoration and furnished terrace overlooking the Aegean Sea. 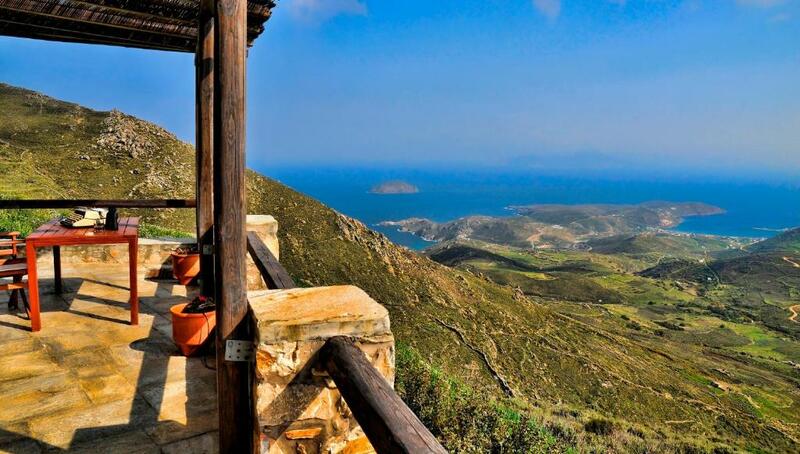 The scenic Serifos Town is 2.5 mi away. Built in local stone and wood, all villas at the Aria Villas Serifos, are decorated in earthy and minimalist black and white colors. Each has a kitchen or kitchenette with cooking facilities and coffee machine. Some villas offer a spacious living room with fireplace and sofa. Guests are offered breakfast daily which they can select from a set list. Livadi, the port of Serifos, is 5.9 mi away. Free private parking is offered at the property. 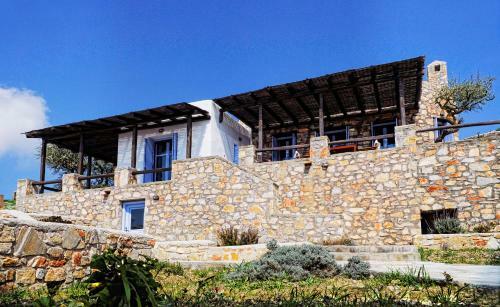 This property also has one of the top-rated locations in Panayía! Guests are happier about it compared to other properties in the area. This property is also rated for the best value in Panayía! Guests are getting more for their money when compared to other properties in this city. 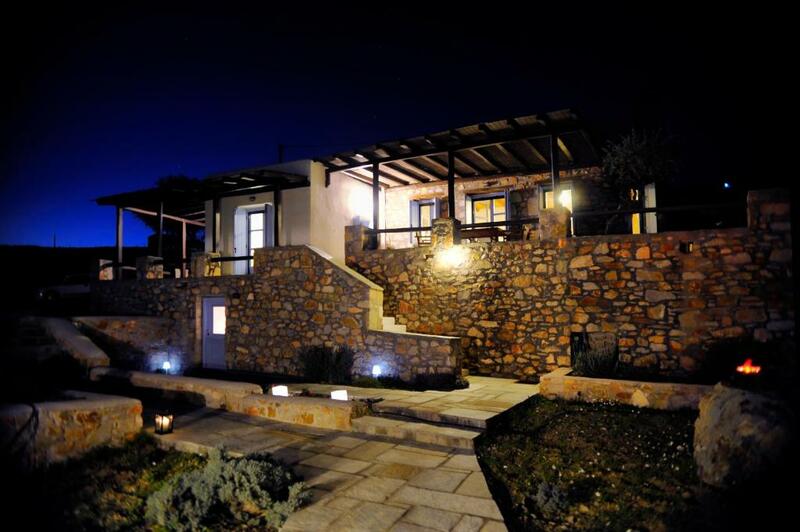 When would you like to stay at Aria Villas Serifos? 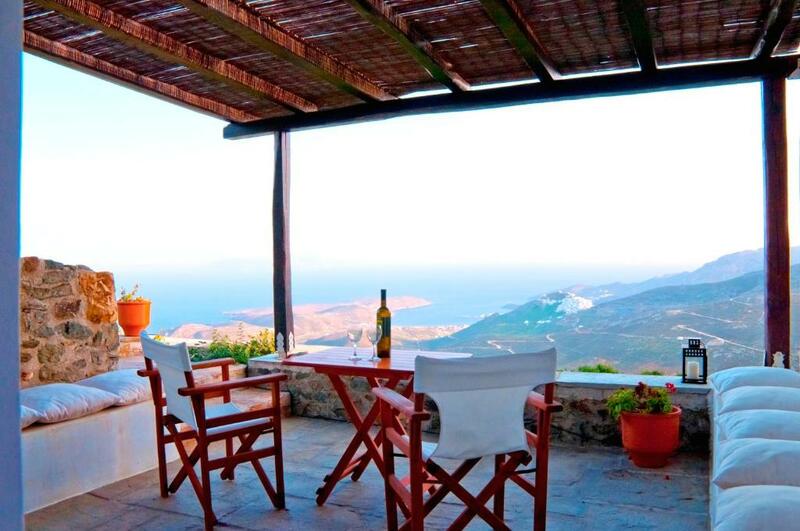 Traditionally decorated villa with private terrace and panoramic views of the Aegean Sea. Offers free Wi-Fi and iPod dock. Includes kitchenette with cooking facilities. All rooms open out to the terrace. 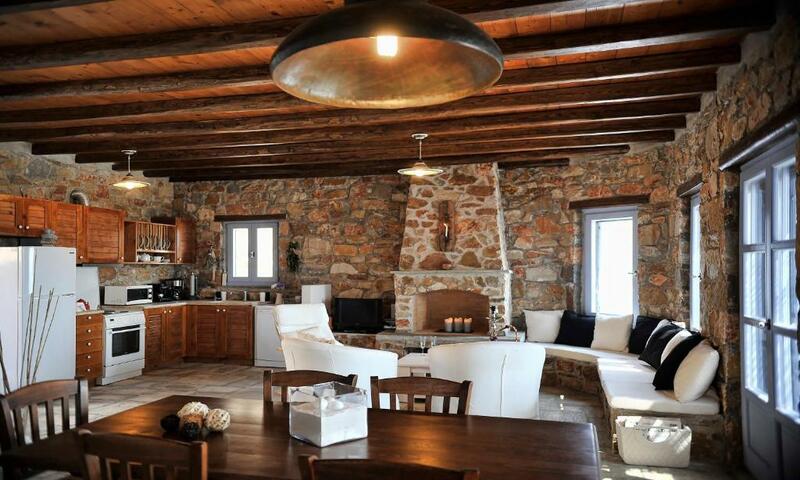 Traditionally decorated villa with 2 bedrooms, 2 bathrooms and fully equipped kitchen. Features spacious living room with fireplace and large, private terrace overlooking the Aegean Sea. Offers free Wi-Fi and iPod dock. 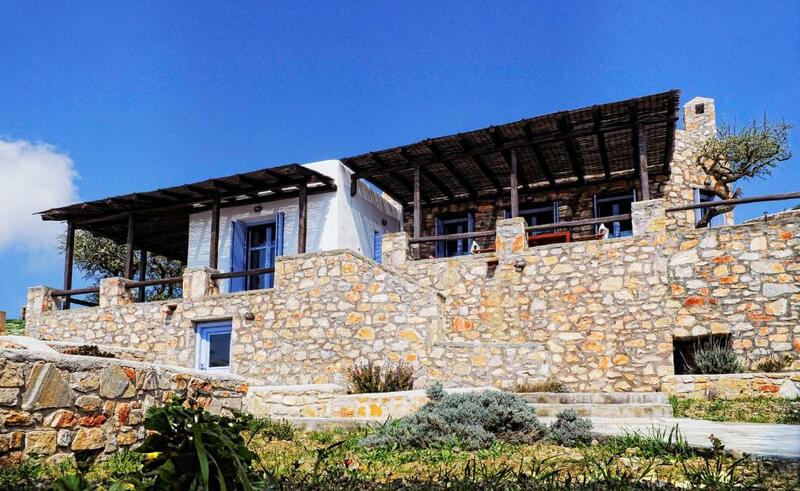 Spacious, split-level villa with traditional decoration and large terrace overlooking the Aegean Sea. 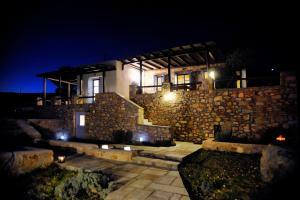 Includes 3 bedrooms, 3 bathrooms, fully equipped kitchen and living room with fireplace. Offers free Wi-Fi and iPod dock. House Rules Aria Villas Serifos takes special requests – add in the next step! Aria Villas Serifos accepts these cards and reserves the right to temporarily hold an amount prior to arrival. Please inform Aria Villas Serifos of your expected arrival time in advance. You can use the Special Requests box when booking, or contact the property directly using the contact details in your confirmation. The location is like the highest point away from anything! The drive up is horrible if you hate heights! Very over priced for out of season. They tell you to leave your card details but then don’t actually use them for the final payment. Probably best to pay the rest in cash when you leave. - We stayed to a super tiny room, it was not a villa for sure. The bedroom was really small! we had 30cm from one side of bed and 1.3m from the other. We were packed in a room. - Bed was not queen size, just a normal double bed - No space for the luggages - No wardrobe - Facility is in the middle of nowhere and car renting is mandatory - Poor breakfast - Overpriced during September (out of high season) - Bedroom, kitchenette and bathroom are individual rooms and every time we had to go out to the balcony in order to change room. inconvenient if you want to visit toilet or kitchen during night and you have to unlock/lock each door. Bottom line, expensive mousehole in the middle of nowhere. This room is set on a booking site as Studio with sea view. The website of the site reads: Traditional Studio The difference is very large and is listed below: What we ordered - we received a complex of three small rooms each with a separate door that all go out to the terrace. A small bedroom with no cupboards but niches in the wall where a few clothes can be put in and uncomfortable. The bed is comfortable but built and attached to the wall where the niches are located so that access to them is difficult. The room is approximately 2.20 meters wide and 3 meters long, 3.5 meters wide. Second room - a kitchen about 4 meters long and 2 meters wide. The kitchen is fully equipped with a table for two. 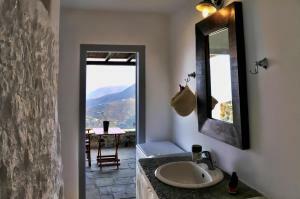 Third room - shower, WC, washing basin and washing machine. Under the hot water boiler you can place bags or suitcases, but access them hard. The terrace - to which all the doors are facing is spacious and equipped with benches built with table cushions and chairs. Overlooking fantastic views. Breakfast in the basket - shame !!! 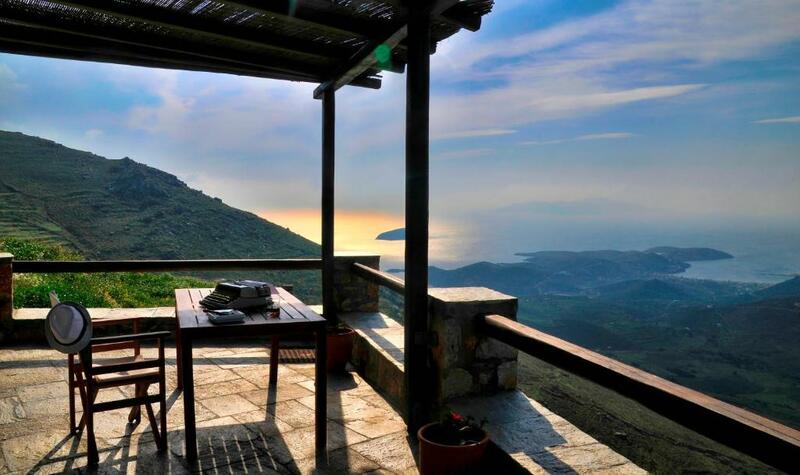 The basket consists of 3 small boxes of honey, 2 small jars of jam, bread for preparing toasts, biscuits, instant coffee, black coffee, tea bags, biscuits in a bag, The direction of the unit is to the east and south so that the sunrise until 16:00 is very hot on the terrace. There are a lot of ants and cockroaches on the terrace, and you have to always close the doors. We would've like to have a washing machine.